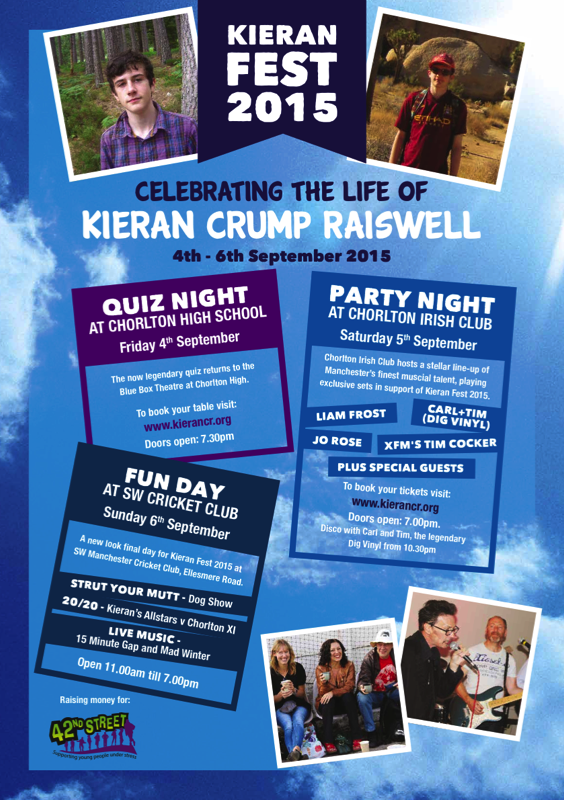 NOW IN ITS 3rd FABULOUS YEAR… IT'S KIERAN FEST 2015! Chorlton teenager Kieran was tragically murdered in an unprovoked knife attack in January 2013 and since then his parents have been working to raise money for the Manchester charity 42nd Street, which works with young people under stress. NOW SOLD OUT - thank you for your support! Cricket match involving family, friends and Kieran's fomer teams; dog show, tug-of-war, barbecue, cake stalls, real ale, 42nd Street stall, singing for fun and more.